Instead of looking at the actual size of the hole in the ozone, NASA measured how many harmful chemicals were in the atmosphere near the hole. 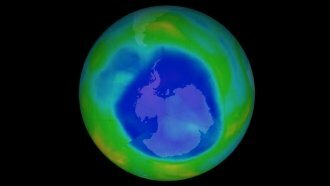 About 30 years since the Montreal Protocol was signed, which prohibited using ozone-destroying chemicals, NASA scientists say they have hard proof the hole in Earth's ozone layer is shrinking. In the past, researchers determined ozone layer health by tracking how much the hole grew in a given time. But now, NASA scientists wanted to see specifically if the man-made, ozone-destroying chemicals in the atmosphere around the Antarctic ozone hole were declining. For example, researchers measured the levels of chlorine, a primary source of ozone depletion, and found it's falling almost 1 percent a year. Although the results of the new study are encouraging, they seem to contradict other recent findings about the hole in the ozone, like one that said it wasn't growing or shrinking. While the ozone hole did shrink to its smallest size since 1988, scientists say it was thanks to an unstable and warm atmosphere — not a drop in harmful chemicals. Even if the results of the new study do hold true, scientists say it will take until at least 2060 for the hole in the ozone to vanish.